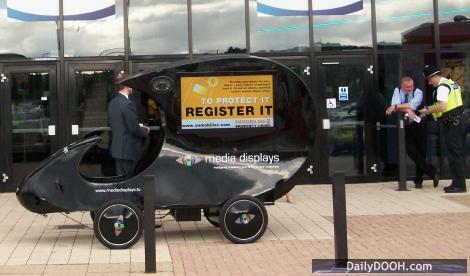 Strangely enough, these DigiBikes from UK based Media Displays  seem to be gaining a lot of interest, last week West Midlands Police launched a crack down on robbery, using the DigiBikes to communicate with people around the West Midlands area in, what will be, a year long campaign. The bike forms part of Operation Crime Cycle aimed at reducing acquisitive crime in the area, and raising awareness, particularly amongst young people and this is the first time that this technology has been deployed across the Midlands area of the UK – crime prevention tips are broadcast onto phones and a video is presented on the two 45 inch DigiBike screens. Detective Sergeant Mark Rushton is heading the operation told us “Since April we’ve seen a slight rise in the number of robbery offences in the area, we have launched this operation to tackle offenders, whilst trying to educate those at risk of becoming a victim”. 1 Comment To "Non Lethal DigiBikes"
I had my push bike stolen in Dudley! Im sure if you left this unattended in Dudley for a few days and went back it would still be where you left it. Perhaps its best sold back to the grand Piano maker who supplied the body work or better still chuck it in the Grand Union Canal and see if it floats!